Suffering from pacing issues, The Ghost Writer is still a worthy mystery film that keeps you piecing the puzzle together until the last minute. Made for fans of playful political mysteries/thrillers. With Roman Polanski’s personal life aside, there is no doubt that the man is great filmmaker. And The Ghost Writer is no exception – not to be confused with Nic Cage’s 2007 motorcycle movie Ghost Rider. 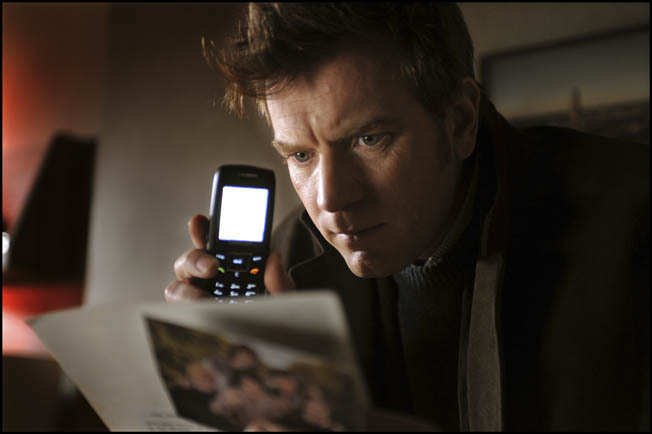 Ewan McGregor plays a nameless character simply titled The Ghost, obviously short for “Ghost Writer” (being a professional writer hired to write a books that are officially credit to other people). The film begins with The Ghost being hired to pen the autobiography of former English Prime Minister Adam Lang (Pierce Brosnan, James Bond). Only hours after The Ghost arrives at Lang’s secluded Martha’s Vineyard home, Lang is accused and implicated in a major war crimes scandal. Lang’s rash behaviors and accusations cause The Ghost to question Lang’s innocence, leading him to a search for clues that might help him uncover Lang’s true past – not only for the good of the autobiography, but for the looming incarceration and trail. Often times, films of this nature are overly serious and dry (see Michael Clayton). But The Ghost Writer’s script takes preventive measures, keeping you entertained. Just when you think you have had as much dialogue as you can handle, some playful gesture will happen that causes you to laugh and relax again. The 128-minute runtime doesn’t exactly fly by, but these anecdotal moments sure help it not feel exceeding long. The biggest problem The Ghost Writer suffers from involves a post-production decision. The Ghost Writer was originally intended to be an R-rated film. At least seven times throughout the film you notice the mouths of characters say the F-word, but the audio you hear says something else. Only the proper amount of F-words for a PG-13 movie are left in the final cut. Usually, the substitute words you hear aren’t even offensive (at least, not in the U.S.). Having this happen several blatantly obvious times throughout the film, it becomes a distraction. You would think that film editing could have eliminated this audio/visual problem, but as/is, it pulls you out of the film each time. Putting your prejudgments of director Roman Polanski aside, The Ghost Writer is a strong mystery worthy of your time. If you like films that put your mind to work, then there is no acceptable excuse for not seeing The Ghost Writer.